The Graco DuoGlider is a well-made double stroller for your children from newborn up until pre-school. It works well for children who are close in age or who are twins. 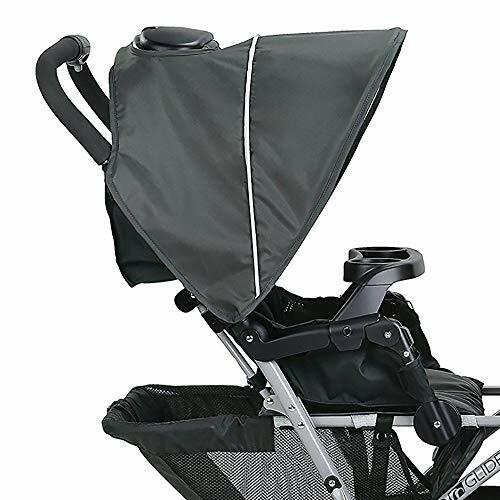 This stroller is also known for its durability and sturdiness, especially considering the price. Let’s look at what else the DuoGlider can offer you by starting with the fantastic features. 5 What is the steering like? 6 What are parents saying? 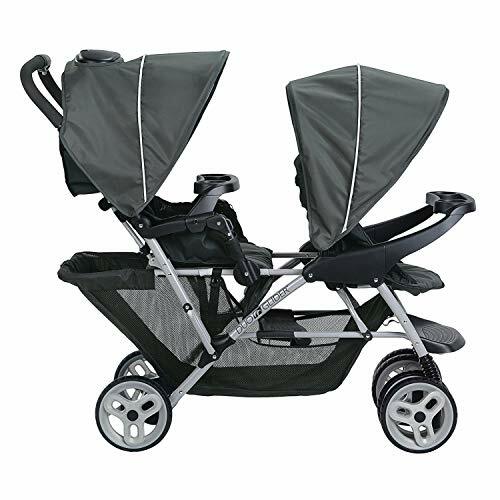 8 Where can I buy a Graco DuoGlider double stroller? Snack trays and cup holders for each seat and foot rests to stretch out at nap time are included. The cushioned seats recline, and the back seat can lie flat for infants. If your older child sits in the back seat they will love the stadium-style seating which allows for a better view. There is also the option to sit in the front seat, though, so that baby can face you in the infant carrier. The front sun canopy can be removed to make it even easier for the back passenger to see out. The rear seat has a peek-a-boo window so you can keep an eye on your children, and both canopies have a sun visor for better shading. Parents enjoy some cushy features on this tandem stroller as well. Keep your cool drink in one of the deep cup holders and stow your keys and phone in the storage tray. The basket underneath runs the length of the stroller, so it’s huge, and can flip down for access. The DuoGlider folds easily with one hand and can stand upright once folded, which can be convenient when putting away other things first or getting your children safely into the car. What is the steering like? 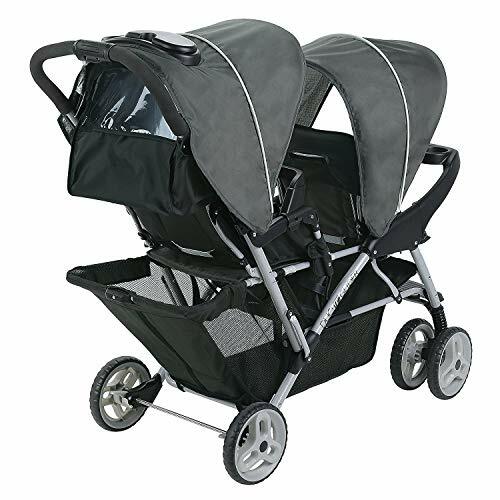 Tandem strollers are known for being more difficult to maneuver, especially as the older child gets heavier. However, the Graco DuoGlider double stroller has nice large wheels to help make the ride as smooth as possible: 8½-inch in the rear and 8-inch in the front. This stroller also has a front-end suspension for rougher terrain and the option to lock the front wheels for more stability. Overall, parents are happy with the Graco DuoGlider double stroller giving it a solid high praise. 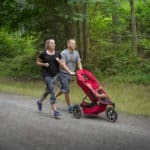 It gets many compliments on its light weight (for a tandem double stroller) and how easy it is to fold with the one-handed collapse. 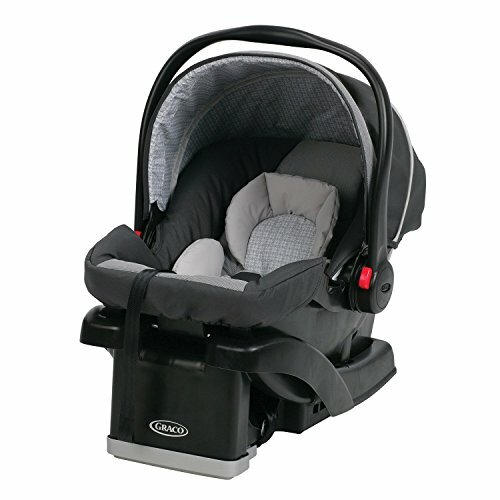 Quite a few parents have said that the stroller holds the infant car seat securely and easily. Others say that the Graco DuoGlider double stroller is durable, sturdy, and long lasting. A surprising number of families have said that this stroller is great at airports and themeparks. Who doesn’t like to make travel easier? Two complaints are heard most often: The first is that this is a heavy and bulky stroller. 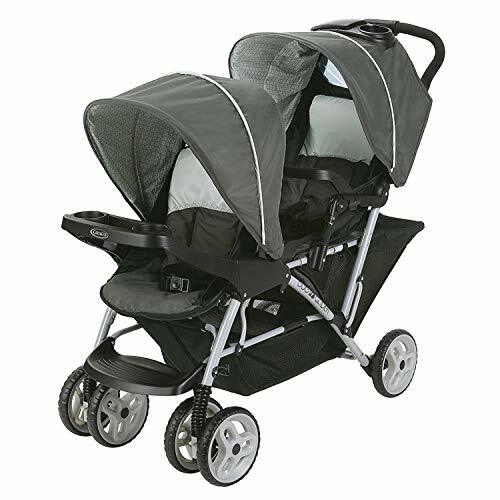 However, this stroller is on the lighter side compared to other tandem strollers in its class, but it is still considered enormous. 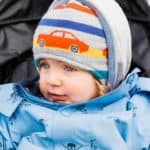 Moms have remarked that in order for the stroller to fit in the trunks of their cars, both the front tray and the canopy have to be removed first. 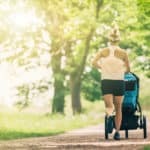 The second disadvantage heard most often is that once children get older, the stroller becomes difficult to maneuver. This is especially true if the older child sitting in the front seat. Some reviewers are dissatisfied that the rear seat on the Graco DuoGlider double stroller has only two positions: fully reclined or all the way up. Keep this in mind when making your decision. Others find the storage basket underneath inaccessible when the back seat is fully reclined, despite the flip-down feature. 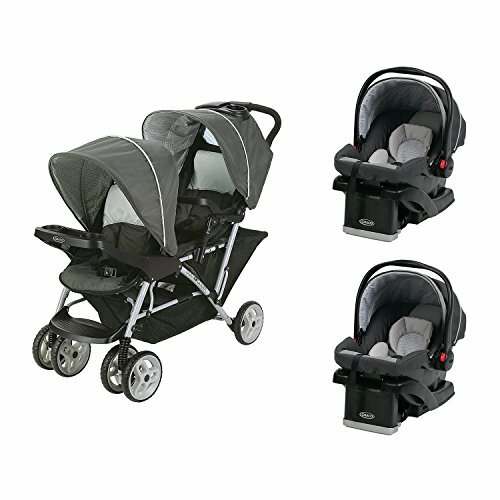 Where can I buy a Graco DuoGlider double stroller? Surprisingly few online retailers have the DuoGlider in stock. You’re going to have your widest choice available on Amazon with two color choices and good prices.